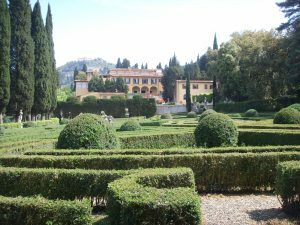 Four miles north of Florence, the Etruscan town of Fiesole offers runners a respite from the crowds, some wonderful quiet streets, and an sample of the Tuscan hills. Many choose to stay there for the less expensive rooms and great views of Florence. 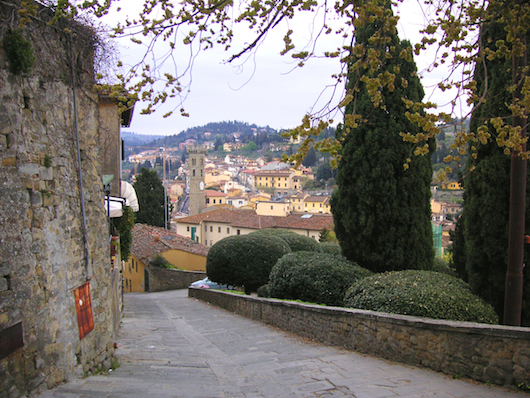 The 7 km run to Fiesole is in the steps of E.M. Forster’s book, ‘A Room with a View’. Note: it’s a 700 foot elevation gain from Florence to Fiesole, with steeper grades for the second half of the run. Also note that some of the roads outside Florence are narrow and don’t have sidewalks. Start in central Florence at the Cathedral of Santa Maria del Fiore. Take via Ricasoli to Piazza San Marco. The next section is a bit tricky. Cross viale Giacomo Matteotti,and take via Frà Bartolomeo. LEFT on via Masaccio and then next RIGHT and down into the underpass, to piazza delle Cure. You’ll then follow the main road, Via Giovanni Boccaccio, for 2 km, passing the Villa Schifanoia and the Convent of San Domenico. It’s a pretty road, shaded, with some old walls, and narrow. Continue following the main road, via Giuseppe Mantellini and Via Frà Giovanni da Fiesole Detto l’Angelico, a nice climb into the central square of Fiesole. For the return, you can retrace your steps, or hop on the train or the bus back. One variation on the route back would be to take Via S. Domenico for 2 km instead of Via Giovanni Boccaccio (shown in our map of the route).